I won these goodies at the Bloggers Unite Summer event, a few months ago. This formed part of my recent winning streak. 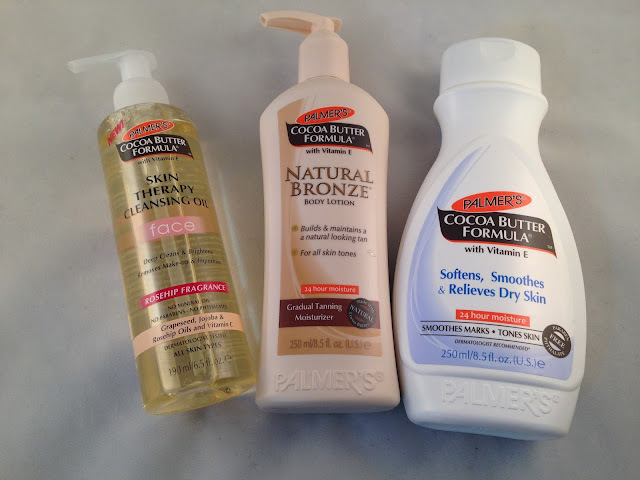 I had already tried a few Palmer's products and I was looking forward to trying a few more. I had seen Palmer's moisturiser before, but I did not know they did skin care and tanning products too. The Skin Therapy Oil I used in the shower in the morning. I prefer oils as they can make my pores feel tight and clean feeling. The oil foamed when it was applied with water, which I wasn't expecting, but it made it easier to apply and then remove with the water in the shower. This is a great product if you like to feel the tightness of your pores but it might be something to avoid if the sound of this puts you off. The Natural Bronze Gradual Tanning Moisturiser, I had tried a few times when trying to get a glowing tan ready for the summer. It is easy to apply, although it does have thick consistency but it dries quickly. I used this after a shower in the morning, and by the time I had brushed my teeth it was dry. The tanning moisturiser does have biscuit scent, which is common with gradual tan products. I did try to cover this up with perfume but I could still smell it on me during the day. This didn't put me off using the product as I loved how quickly it built up a glowing tan without the effort of fake tanning. 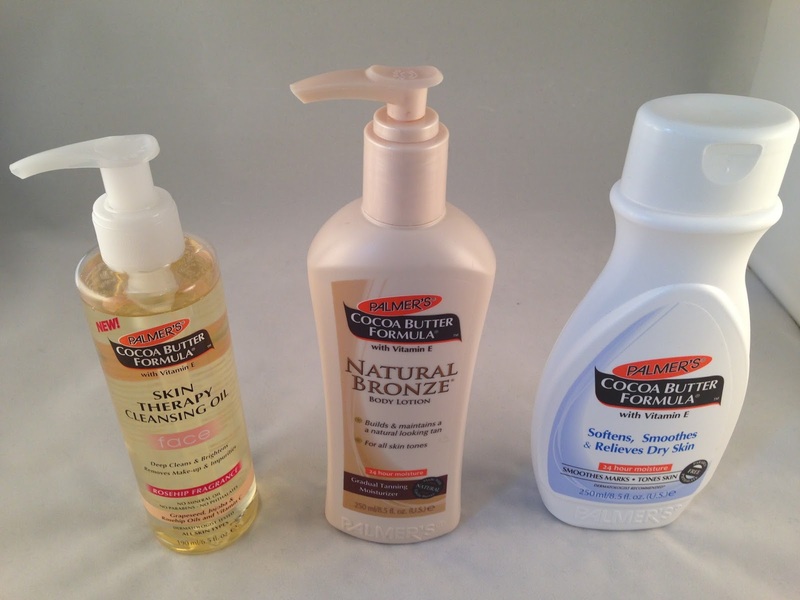 Cocoa Butter Lotion is my favourite of the three products reviewed here. It has a strong smell of cocoa butter which I love and it leaves my skin so soft. I used this at night before bed and it was perfect on the dry skin on my feet and sometimes on my elbows. I used this daily and there isn't much left now. After I have used this up I will definately be re-stocking. This would be great to take on holiday after you have been around the pool or with sunburn as it has soothing affect. The vitamin E is great for an even skin tone, for stretch marks or any scars. It can try to help with there appearance and then make them less noticeable. 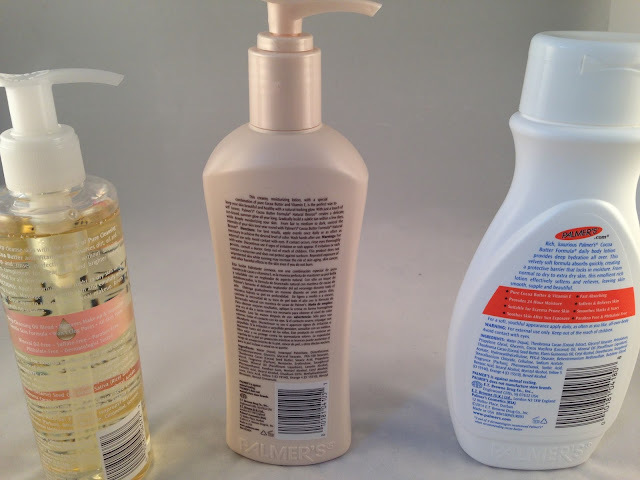 The only small thing that I wasn't a huge fan of was that it didn't have a pump, it was a squeeze one, which I find isn't that helpful when applying and trying to get every last bit of product out of the bottle. Have you used any of these Palmer's products before? 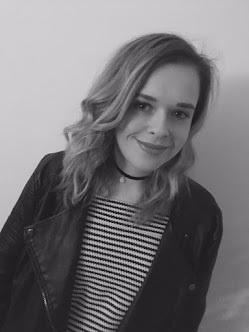 What are your thoughts on the range?